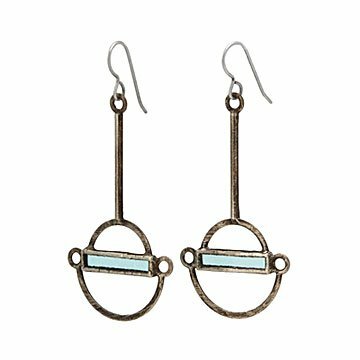 Etta Kostick's refined stained glass earrings were inspired by morning light glimmering on the horizon. Jewelry artist Etta Kostick was raised by a family of glassblowers along the woodlands and seashores of Massachusetts. The refined geometry of her Daybreak earrings, inspired by the first glimmer of morning light coming over the horizon, show the influences that have blended and remixed in her mind: nature, tribal designs, and the architecture of Chicago, her current hometown. Their lightweight, hand-soldered frames and beautifully tinted glass incorporate strong modern lines with a delicate look. Handmade in Chicago, Illinois. Artist Etta Kostick was raised by a family of glassblowers along the woodlands and seashores of Massachusetts. “At seven, I learned glass work from my parents,” she says. “Throughout my childhood, stores around New England carried my lamp-worked jewelry.” Her hobby grew into a passion for exploring glass as a medium. After moving to Chicago in 2007, she started experimenting with stained glass, attracted to the many colors and textures, and its relationship to light. Her designs draw upon nature, Chicago architecture, and her experiences traveling. “I was initially inspired by tribal jewelry and adornments I had collected from South Asia,” she says. I loved the strength in the shapes and the feeling of empowerment they give to the wearer. I strive to create jewelry that incorporates both these bold shapes as well as more delicate and organic elements.” She loves the transformative properties that occur when integrating multiple materials together, and is constantly exploring and developing new visions for her jewelry.